Medicaid is Drowning Our Kids in Toxic Psychiatric Drugs! The number of children on Medicaid taking antipsychotic drugs has tripled in just ten years—and shockingly, many of them are under the age of three. Note that these are not just antidepressants, which are bad enough. We are talking about strong antipsychotic drugs. These are so strong that many adults stop taking them because of severe side effects. How can a three-year-old protect himself or herself from the toxic effects of these drugs on their undeveloped brains and bodies? The US Department of Health and Human Services (HHS) is launching an investigation into the over-prescription of antipsychotics to children on Medicaid, and has already asked all fifty states to provide more oversight of these prescriptions. Medicaid more than doubled the amount it spent on antipsychotic drugs between 1999 and 2008 (the last year for which data is available), and now spends $3.8 billion on antipsychotics, more than any other class of drugs. In 2004, a child on Medicaid was four times more likely to be on antipsychotics than a child with private insurance. And it’s not just the older kids: of the 600,000 minors in the Medicaid program who were on antipsychotics in 2008, more than half were under the age of 14. So far, the HHS probe has found that 482 children under the age of three were prescribed antipsychotics, and 107 children under the age of two. Six were under a year old, and one was an infant just one month old. This is almost unbelievable. Are we still living in the dark ages that we would do this to a newborn? Disturbing as this is, a spokeswoman for the Texas Health and Human Services Commission defended the prescriptions, saying, “For infants, the drugs aren’t being used for behavior. 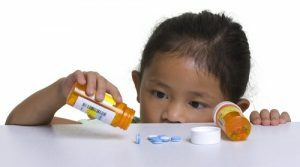 The infants most often have seizures or complex health issues like heart and respiratory problems, and these drugs can be prescribed to help with discomfort.” Did she say “discomfort?” Keep in mind that common side effects for one common psychiatric medication include a shuffling walk, drooling, rapid weight gain, and the inability to speak. Stopping the antipsychotics often involves a wrenching withdrawal period of nausea, vomiting, insomnia, tremors, dizziness, and even hallucinations. It’s a terrifying list even for an adult, and even more so for the very young children being given these drugs. Over-prescription of these powerful drugs is a lose-lose situation for both taxpayers and the children who take them. The antipsychotics used today are known as second and third generation antipsychotics, and have names such as Abilify (which is the nation’s top-selling prescription drug), Risperdal, Seroquel, and Zyprexa. They replaced drugs such as Haldol and Thorazine, the first generation antipsychotics. Antipsychotics were originally developed to treat psychoses such as schizophrenia, but some now have FDA approval for the treatment of children with bipolar disorder, as well as irritability associated with autism. However, antipsychotics were never actually tested on children, and were never intended for long-term use, even in adults. We reported two years ago about the excessive number of kids in foster homes taking antipsychotics. Because of the huge number of people on government assistance who are on these drugs, 70% of the total spent for antipsychotics in the US is paid by the US government—that is, taxpayers. This is nothing less than crony capitalism in action: pharmaceutical companies donate heavily to political campaigns, and legislators pass laws that compensate them in spades for the amount donated. Those who pay the real price are the poor and powerless. Assessing any drug is difficult, since trials with negative results are often buried and the trial simply repeated. One study showed that roughly half of all drug trials for antidepressants had positive results, and half did not. However, 97% of the positive results were published in peer-reviewed journals, while only 8% of the negative studies were! A doctor reviewing clinical journals could easily come to the conclusion that antidepressants are much more effective than they are. In 2012, a judge in Arkansas ordered Johnson & Johnson and a subsidiary, Janssen Pharmaceuticals, to pay more than $1.2 billion in fines for minimizing the dangers associated with the antipsychotic Risperdal. Texas settled a case with Janssen for $158 million and a South Carolina judge fined them $327 million. A Louisiana jury awarded $258 million in damages. And they are now being sued by Kentucky for concealing the harmful side effects of Risperdal, which include stroke, diabetes, and weight gain. If not antipsychotics, what do these kids need? An integrative physician who deals with either physical or psychiatric disorders should, of course, be your first and best resource. And it should go without saying that all children need a secure, loving home, nutritious meals, regular exercise, and protection from abuse and other dangers. Importantly, that also means protection from abuse by the medical system. In addition, children at risk for psychiatric problems are good candidates for a program of omega-3 fatty acids: a study in the Archives of General Psychiatry found that fish oil supplements beat mental illness. The study involved eighty-one people deemed to be at high risk for psychosis. The randomized, placebo-controlled study provided fish oil supplements to half the study subjects for twelve weeks; the other half received placebos. Eleven people in the placebo group developed a psychotic disorder, but only two in the fish oil group did. But love, nutrition, exercise, security, and fish oil cannot be patented, eliminating the profit incentive to supply them. By contrast, with Medicaid laying out $3.8 billion per year on antipsychotics for children, the motivation to try to control a troubled child with a pill is evidently quite strong.